They urged him to make changes in the senate’s archaic rules while he had a Democratic majority vote. That action may only be taken at the start of a new congress. Don’t they trade horses in Reid’s Nevada? Doesn’t Harry know that if a horse trader offers you a “too good to be true deal on a mare”, look closely at the animal’s past history and then study her teeth? Harry Reid was snookered (tricked, fooled) by Mitch McConnell, who promised him a good deal on a mare in a deal that was “too good to be true” to run the senate, the old way. 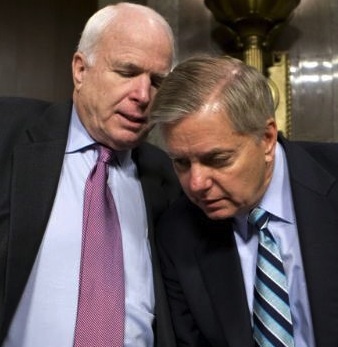 Reid was also snookered by John McCain (AZ) and Lindsay Graham (SC), (above) two veteran members of the senate who claim all they want is “more information” on what happened at Benghazi before they would allow an up or down vote on the confirmation of Chuck Hagel as defense secretary. That is Republican-speak that has nothing to do with Benghazi and everything to do with their awareness that Hagel does not meet their “I love Israel” taste test. A snookered Reid was so angry about what was obviously a move to a Republican filibuster, that he called for an up or down cloture (“closure”) vote on whether or not to end debate on Hagel’s confirmation. The Republicans knew he would lose that vote. They politely suggested a delay in the vote until February 25 (or 26) giving them more time to find something, anything, that would disqualify Hagel as defense secretary. They have been looking since December and they have always come up empty-handed. Hagel is backed by virtually everyone but Fox News, Rush Limbaugh and Republican party “I love Israel” senators. Under those archaic senate rules Reid refused to change back in January when he had his chance to do so, a cloture vote still needs a 60 vote majority. To reach his required 60 votes to defeat cloture, Reid started with 55 affirmative Democratic votes. Even conservative Democratic senators in danger of neoconservative primary opponents, stuck with Reid. After that, Reid needed five more senators to win the cloture vote and end debate. Reid picked up four Republican votes in favor of cloture, Senators Mike Johanns (NE), Susan Collins (ME), Thad Cochran (MS) and Lisa Murkowski (AK). voted present. An affirmative Orrin Hatch (R-UT) vote would have put the total at the winning total of 60. Instead, Hatch voted present, making the final cloture vote 58 for and 40 against. Reid had reversed his yes vote to no, making it possible for him to call for another senate vote when the senate returns February 25. When Reid spoke on the senate floor Thursday afternoon, he expressed frustration over the tactics of the obstructionists–led by Senators James Inhofe (OK), John McCain (AZ) and Lindsay Graham (SC)–which forced the cloture vote that Reid lost. But be not fooled, this whole process has been a charade to snooker the public into believing the Republicans speak the truth when they say they only want to know about Hagel’s finances, or Benghazi, or organization boards on which he sits, or speeches he has given throughout his career. What really drives the Republicans is a desire to undermine a sitting Democratic president. Mitch McConnell famously said at the start of Obama’s first term that the Republicans would spend four years of non-cooperation with Obama. What the McCain-Graham-Inhofe filibuster is all about is a continuation of McConnell’s anti-Obama strategy from the first term. In moving toward the cloture vote and the filibuster, Republicans threw up a variety of reasons for opposing Obama’s nominee for defense secretary. The reason menu had changed as often as your local restaurant changes its daily specials. The current obstructionist rationale du jour is an old favorite, the special that first delighted the Republican conservative base’s palates when Susan Rice’s name was initially suggested as Obama’s next secretary of state, what happened at Benghazi. First, with Rice and now with Hagel, Republicans are dishing out familiar questions: What does the White House know–and when did the White House know–the “full truth” about the four tragic American deaths at Benghazi. That demand is leveled at President Obama, of course, since neither Hagel nor Rice had any responsibility in the events surrounding the Benghazi deaths. To attack and smear Hagel, Republicans have falsely questioned his character and his integrity, including the absurd implication that he has the backing of Iran in his quest for confirmation. MSNBC’s Rachel Maddow has recently leveled her playful commentator style at Republicans who have been obstructing Democratic nominees. When hearings began on the now-confirmed Secretary of State John Kerry, and the still-pending Chuck Hagel, Maddow skewed Texas Republican Senator Ted Cruz for his aspersions against both Kerry and Hagel. The clip below includes a section of a speech Cruz made during an event sponsored by a media powerhouse of the conservative movement, the National Review. For the last four years, Senate Republicans have used the power of the filibuster to block legislation, bottle up nominees to courts and government departments, and strangle federal agencies, even though they are in the minority. On Thursday, they hit a new low. They successfully filibustered Chuck Hagel, President Obama’s nominee for defense secretary, the first time a cabinet nominee for this post has been prevented from receiving an up-or-down vote. These next ten days may well be the darkest moments in the life of the Republican party, and its allies in the right-wing government of Israel. Sometimes, winning leads to a much larger defeat. This could be one of those times. This entry was posted in Middle East Politics, Obama, Politics and Elections, US govermemt. Bookmark the permalink. ARE THESE SENATORS PAID FOR AND BOGHT BY THE ISRAELI LOBBY. MAN THIS IS AMERICA AND NOT ISRAHELL. WAKE UP FOLKS. THEY WILL SELL YOU DOWN THE DRAIN ANY TIME THEY LIKE. Thanks, Jim, for you scorching, excellent summary of events. It is very sad to see even Senators behaving like children in diapers! Of course it’s all about Israel. I only hope Hagel did not sell out his values to get the position. He had to recant these positions to Senator Chuck Schumer, the prominant New York Senator who grilled Hagel to make sure his positions on Israel were the mandatory AIPAC positions. Senator Schumer is the senator who publically stated that he was the “Guardian of Israel”. In most other nations, if a government leader stated they were the guardian of another nation, they probably would be forced to resign. In the current atmosphere with Israel having colonized Congress, Benedict Arnold could occupy the Senate seat next to Schumer, so long as his defection was to Israel. And with Aipac $$ behind him, Arnold would surely be reelected. America just can’t shake that deep-seated power-envy admiration for its colonists. As to videos, SNL fans will appreciate this satire on the Hagel hearings. Not only do I agree with Fred’s and Robert’s comments regarding Sen. Schumer, I would urge all to let Schumer know that a growing number of Americans are aware of his declared “guardianship” of a foreign power. He needs to be reminded, in addition to the issue of his oath of office, that allowing Benjamin Netanyahu to lie and bully this great country is a disservice to both Israel and the United States. Thank you for exposing the AIPAC-via-Republican fiibuster for what it is. AIPAC has been using – primarily via Republican puppets – every trick in the book to make it seem and sound as though there were reasons “OTHER” than Blind Allegiance to Israel that were at work here. AIPAC will not distract us, or fool us. Care about America please! Remove these Israel first Congress supporters from office now! They are committing treason! The Senators that are in bed with Israel can not think of their beloved country America and its people because they are afraid of the Israeli Loby to blackmail and scandalize them with the MONEY and TRIPS that are provided by AIPAC with American tax dollars that is given to Israel by the USA as foreign aid. Just read the book They dare to speak out, by Paul Findly former congressman from Illinos. The questions were so blatantly pro-Israel, you have to wonder how Americans loyal to the U.S. can vote these people back into office. I was interested in the question where Sen. McCain asked Sen. Hagel if it were true that he had said Israel had committed war crimes. Hagel’s big mistake was not saying emphatically that Israel had indeed committed war crimes, and commits them every day. So we should stop subsidizing that rich country and its cruel occupation and save the $3.2 billion a year, especially now that we have a deficit. That would have given the Israel-firsters something to puff and blow about. Thanks, Jim! Those who are trying to defeat Hagel’s nomination are playinmg with a political deck of cards (gimmicry) that have no spades. It is high time we started using a real deck so that we can call a spade a spade! !